Let’s just say that you happen to be Darth Vader, and wished that your son could be at your side to rule the galaxy. Surely for a man in such a position of prominence and power, you would have to attend a fair number of meetings, as a megalomaniac like you would loathe to relinquish the day-to-day decisions in running the Empire to mere mortals in your sight, right? 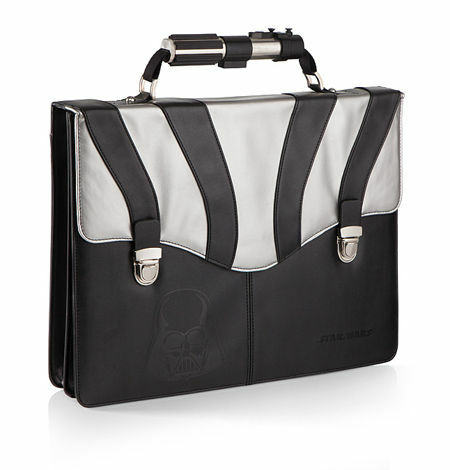 Hence, it is imperative that you carry a briefcase to store all of the meeting notes and the ilk, and what better way to do so than with the menacing looking $99.99 Darth Vader Briefcase? This is one briefcase that Darth Vader would do well to tote with him wherever he goes, as it carries all visual cues as to who it belongs to. For instance, the top handle has been shaped to resemble that of Vader’s lightsaber hilt, while a padded sleeve for your tablet or laptop offers additional protection – as long as those laptops will not be larger than 17″ in size. This officially-licensed Star Wars merchandise also has a removable shoulder strap with pad that can adjust itself from 12″ to 23″ drop, while Vader’s helmet and Star Wars logo are debossed at the front. Too bad this is not going to mix it up with some pleasure like the BBQ Briefcase.